Well, folks, I’ve managed to do some painting! Not a great deal, to be sure, and they’re hardly the best I’ve ever turned out, but I’m glad to have them at this point so quickly. I mean, the bases still need to be done, and I think I might go back and tidy up a lot of things soon enough, but still! I’m painting the Cult of the Bladed Cog, which has an interesting backstory that is linked to the Adeptus Mechanicus. The story goes that the cult began on Feinminster Gamma and rose up when the Mechanicus arrived to harvest the planet’s bioelectricity – at least, that’s what the old painting guide for the Genestealer Cults had to say on the matter. The 7th Edition Codex explains that the cult apparently infiltrated the Mechanicus’ operations on Feinminster Gamma, which better explains the close relationship that appears to exist between the two – the red on the cultist armour and so on is evocative of the Skitarii of Mars. I’m really enjoying painting these gribblies, I have to say. I think the Dark Eldar from last year kinda got in the way of my Genestealer Cult progress, as I’d been building up a bit of a force before moving over to the dark kin. But the cultists have always been there, much like their in-universe incarnation, biding their time and waiting to strike! This book was released back during the autumn festival of Genestealer Cults in 2016, and I’ve been wanting to get around to it for a long time. I managed to read through it in the run up to Christmas, and I actually really enjoyed it! It tells the story of a group of “pilgrims” on their way through the galaxy, seeking religious solitude of the planet Redemption, which was the scene of a massacre of Sisters of Battle in the distant past. The pilgrims arrive, but are immediately drafted into the Imperial Guard regiment to help defend the planet against some vague, nebulous threat. There is an air of mystery about the planet as the story unfolds, and we learn of the not-quite-human denizens who live in the civilian town near to the garrison. The story is pretty decent as it shares its secrets, before an explosive finale that sees the Cult of the Spiral Dawn rise up, even within the ranks of the military. 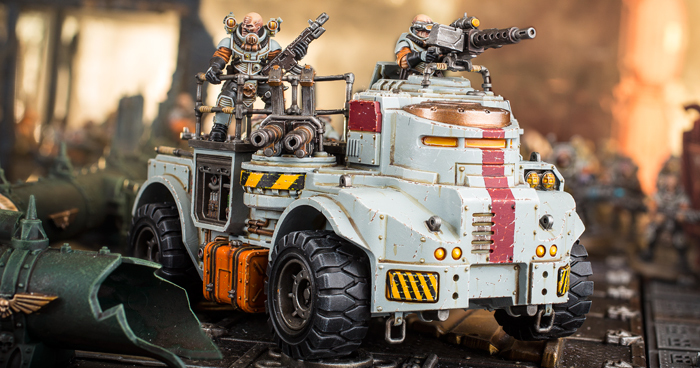 While I did enjoy the book, a cynical part of me was struck by just how closely it manages to tie itself into the Genestealer Cult range of miniatures, from the cultist models of the Magos and Primus (and even the Patriarch), to the Astra Militarum tie-ins like the Sentinel. Of course, the book was released in order to continue the hype, and whatnot, but it does exist as a decent enough read in and of itself. It’s coming out soon in paperback, as well (as Cult of the Spiral Dawn, fyi), so well worth investigating! 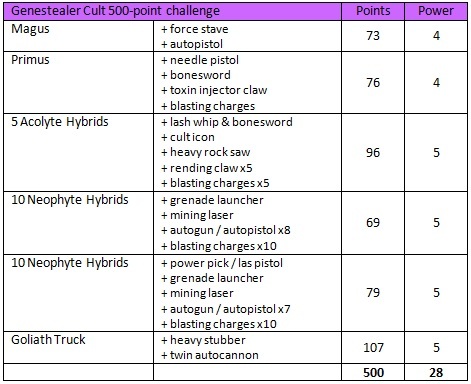 Author spalanzPosted on January 28, 2018 January 28, 2018 Categories WarhammerTags Genestealer Cult, Warhammer 40kLeave a comment on Genestealer Cult progress! 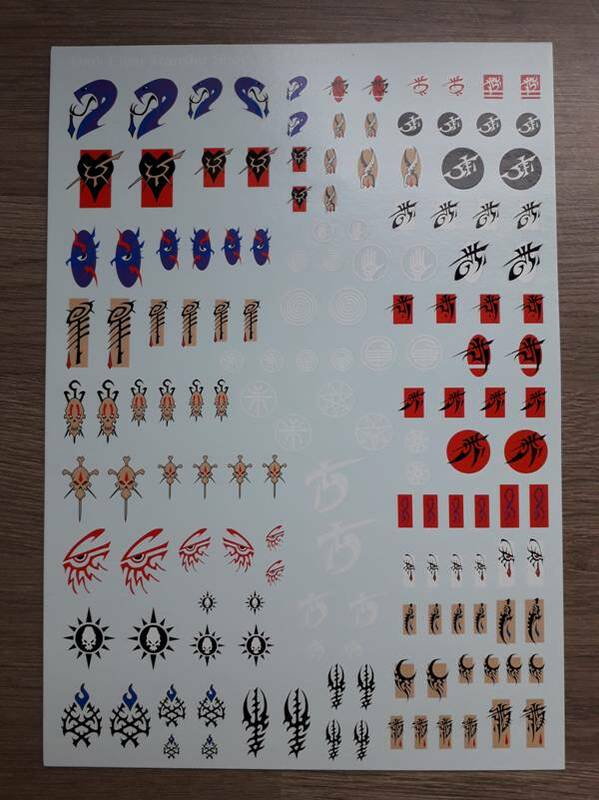 Back when I was starting up my Dark Eldar force, I remember being pretty chuffed at discovering the Kabal I had chosen had its own transfer on the sheet included in almost every box. 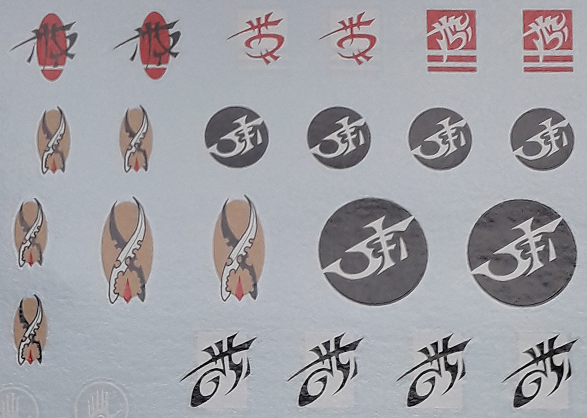 Remembering also the amount of time spent on trying to research what all of the different symbols are for, I thought I’d share the fruits of those labours with you all now, and hopefully save some time in the future! So let’s take a look at the sheet, from top to bottom. We’ll start with the Kabals (on the left). The first one looks a bit like a weird kind of fish – the Kabal of the Poisoned Tongue, led by none other than Lady Malys herself. Next we have possibly the most familiar symbol, as it was also used as something of a generic faction symbol by GW for the army – it’s the Kabal of the Black Heart, whose leader is the all-powerful Asdrubael Vect. Thirdly, a weird eye-like shape with what looks like lightning running through it represents the Kabal of the Slashed Eye, naturally. 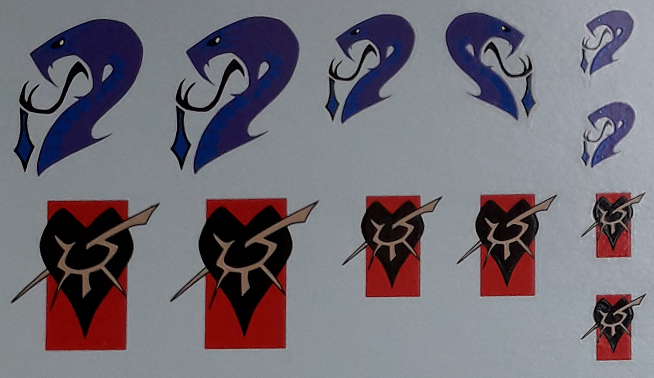 The fourth icon is close to my heart, as it is that of my own kabal, the Kabal of the Obsidian Rose. Beneath them, it’s the Kabal of the Flayed Skull. 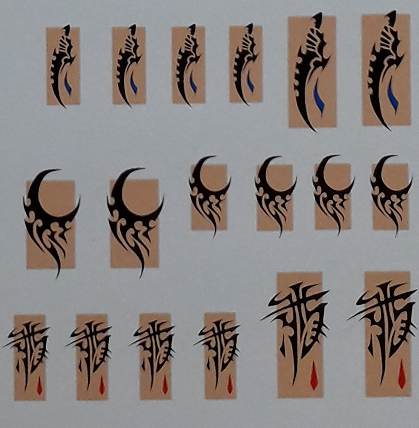 We have an interesting cluster of symbols here: from top to bottom it’s the Kabal of the Last Hatred. Underneath these, it’s the Kabal of the Baleful Gaze, and then the Kabal of the Dying Sun, the latter of whom have that beautiful deep blue with red trim colour scheme. 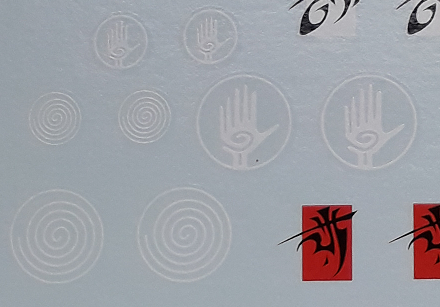 And finally, the white icons down the right hand side here represent the Kabal of the Broken Sigil. 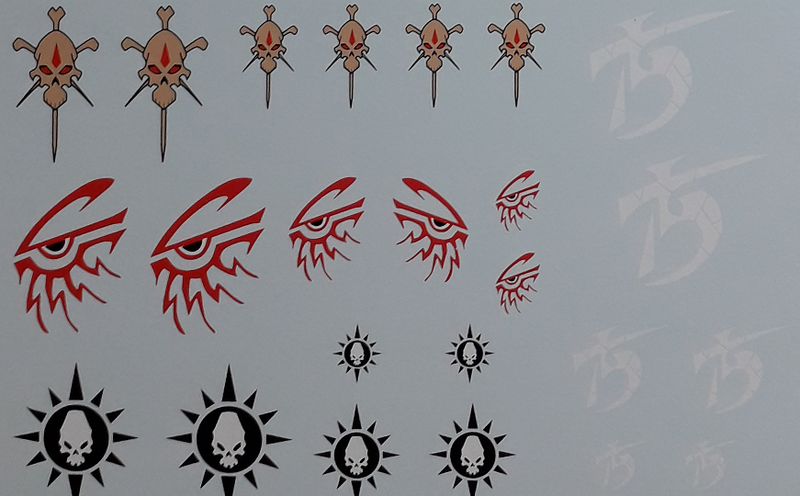 At the bottom of the sheet are two further kabal sigils, those for the Kabal of the Lords of Iron Thorn, and on the right, the Kabal of the Black Myriad. The hand symbol is that for the Prophets of Flesh (those haemonculi led by Urien Rakarth), while the swirl is (unsurprisingly) that of The Everspiral. Up next, we have a strange insect-like symbol is that of the famed poisoners The Altered, while the symbol to the right is that for The Dark Creed. 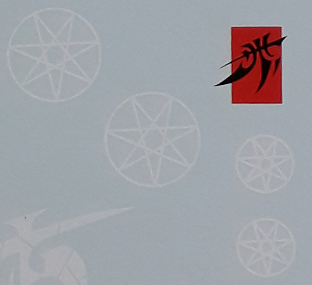 Lastly, the star-like design is the symbol of The Hex. Let’s trundle on down the right-hand side of the sheet now, where we can find the symbols of the various Wych Cults of Commorragh! 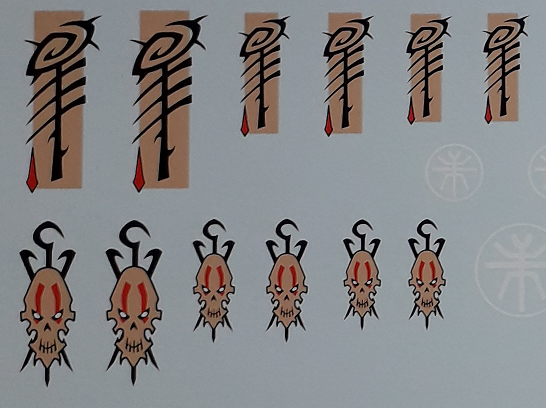 I won’t lie, the Wych Cult symbols are much more difficult to make sense of, but in the middle-left here, we have the paired blades of the Cult of the Blade Denied. 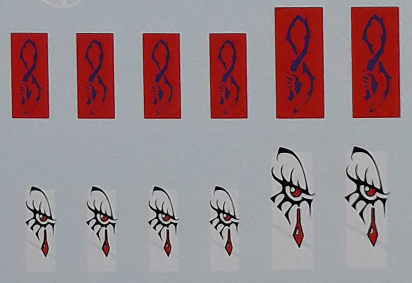 These symbols outlined in red are very common on vehicles, but I can’t seem to find any reference to them belonging specifically to any Cult. 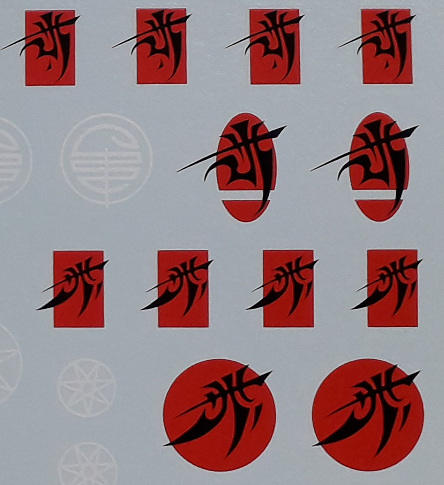 I guess they’re just generic Eldar glyphs that can be used at will! Next is the Cult of the Pain Eternal, and the Cult of the Red Grief, which most closely resemble my own Cult. The last trio represent, from top to bottom, the Cult of the Cursed Blade; the Cult of the Seventh Woe, and last but by no means least, the Cult of Strife, which is of course led by none other than Lelith Hesperax. Well, then! 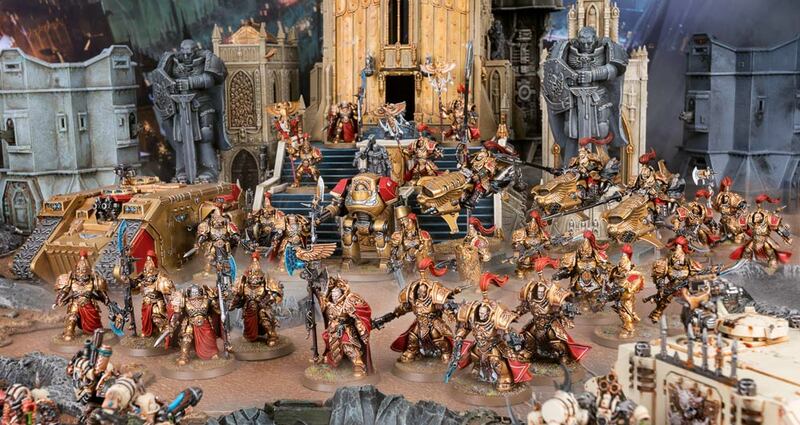 I’m glad to see that the Codex train is still going, and while I’m a bit perplexed that they’re doing a brand new army over an existing one, I suppose it does stretch things out. Of course, everybody wants their Codex, so these releases are bound to aggravate a few. I’m surprised at the amount of hate coming from, specifically, the Dark Eldar facebook group I’m a member of, but I can kinda see their point. 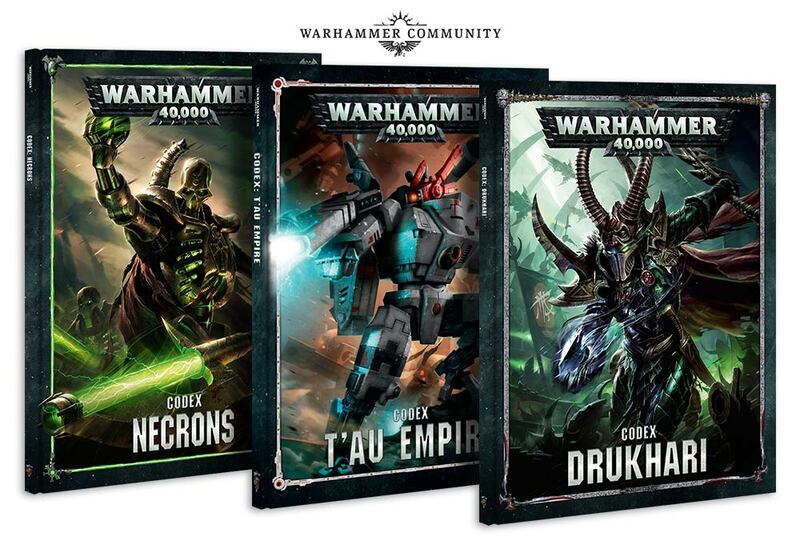 There are huge xenos factions like the Orks and the Tau that don’t have a book yet, while the tiny, elite imperium factions are getting more love. It’s fantastic that there are new factions coming to the game in a really playable way, and I really enjoy seeing these corners of the 41st millennium explored, but I’m getting a bit bored with my Index armies now (specifically, my Necrons…), and feel like it’s becoming almost a chore to play with them. I’ve specifically avoided playing anybody who can use a Codex so far, but have managed to find myself with a game against Craftworlds later in the month. From what we’ve been talking about, I feel that my Dark Kin are going to be vaporized fairly quickly, even with a fluffy list, so while I’m interested to see what Eldar can do (having never played them before), I’m also not looking forward to it due to the matchup. It’s a really weird situation right now, to me at least. Chapter Approved was a nice addition, but hasn’t really done anything to even the balance between an Index and a Codex. But then, the only thing that can do that is Codexes for everybody. At any rate, it’s a bit of a futile argument right now – this is the situation, let’s just get on with it! I wanted to ramble for a bit today about my most recent game of 40k, another battle between my Dark Eldar and Robin’s Orks at my local store. It was a hilarious battle that took four hours to play just two rounds, due to the ridiculous amount of melee combat going on from Robin’s first turn! I took the usual load of Warriors in Raiders, as well as Wracks in another Raider. I managed to get three HQs into the list, two Archons and a Haemonculus, the latter riding in his own Venom. The second Venom was given over to five Trueborn, the first time I’ve ever used those chaps, and a squad of Reavers and a Ravager rounded out the list. I will freely admit right now, that I’m not the most tactical of people, but I’ve decided that, from this year, I want to try and have more nous about me in games. I feel like I’ve mentioned this before in respect of playing X-Wing, where my usual tactics of fly around shooting stuff at random probably doesn’t make for a good game for my opponent. It’s a game, we’re supposed to have fun, but I don’t want to be that guy and ruin it for people, you know? So anyway, faced with a mob of 30 Boyz, all of whom were pretty much on top of the relic we were fighting for, my target priority became that unit, and in my first round of shooting I managed to get rid of 22 of them. Not bad, from two Raiders full of Warriors, and a Venom full of Trueborn! It certainly helped that everybody started within rapid fire range, I have to say. In the spirit of trying to learn from my games, then, I think I’ll ramble for a bit here whenever I play, and see if I can improve as time goes on! A lot of this is focusing on weight-of-fire as opposed to damage output, as I feel currently that Dark Eldar could be pretty good as a horde army. I mean, you could make a basic squad of ten warriors with no upgrades for 70 points, which can put out 24 shots in rapid fire range and hitting on 3+. I’ve had a lot of experimentation with different builds, but I’m currently thinking I’d like to try a sort of mass swarm of Kabalite Warriors, with occasional support from more combat-orientated units. Covens are a lot of fun to play, but I’m going to try and move away from them a little as I experiment more with Warriors. Wych Cults are going to be a whole other breed of experiment, though, and I think I could write a separate blog on that one! I really liked the Trueborn. I’d built some for 7th Edition, but had shied away from ever using them in 8th due to the fact I wasn’t convinced about the points cost. The only benefit, to me, was that they can take much more in the way of weapons, but with an almost identical stat line to generic Warriors, were they really worth it? Turns out, I’d been thinking about it the wrong way: the fact that you could have an entire unit of special-weapons-ops, as opposed to just the one, means a lot more in the way of firepower, easily making up for those points differences. I took a five-man squad, and popped them in a Venom. The squad had two splinter cannons, two shredders, and a Dracon with power sword and blast pistol; the Venom itself had two splinter cannons. That’s 210 points, right there. When I compared it with my ten-man Warrior squad, with splinter cannon alongside a Sybarite wielding a splinter pistol and agoniser, all inside a Raider with a dark lance, the Warrior squad still comes in at 204 points, for almost double the models. The startling thing, to me, was just how many shots the Trueborn were consistently putting out. At optimum distance for everybody, but assuming the worst for the shredders, five men in a Venom are pumping out 27 shots (with a potential for 31), 24 of which are poison. The ten men in the Raider are capable of 24 shots at optimum distance. It’s not much difference but, when faced with a horde army, I’ll still take it! Definitely time to build more Trueborn. But not, I think, with dark lances! Even on Trueborn, they just feel too damn fragile on infantry – the weapon is almost double the cost of the model wielding it (which is, admittedly, better than the almost-triple cost of putting one on a Warrior). I still don’t know what to do with my Ravager though. I prefer the disintegrator cannons for the assault 3 as opposed to the dark lances which, on a vehicle, are only assault 1, even though the dark lance has the greater damage potential. However, I can never decide where to fire the damn thing, and invariably just end up having a mediocre performance, at best. Sad, really. My Reavers did fairly well – they lasted quite well despite being rammed into a squad of Boyz on turn one, anyway! I don’t play enough Wych Cult units, so had forgotten about combat drugs on my first turn, so turn 2 I gave them adrenalight for the +1 attack (as they were already locked in combat). The arena champion making 4 attacks was pretty good, but at that point it was only the arena champion left, so I think that needs to be looked at anew! I’m considering a bigger squad but, as I said, Wych Cults will be the subject of their own blog soon enough! So, Trueborn are worth further exploration. I need more splinter cannons in my life, and I need to figure out how to use my Ravager more effectively. I also need to stop charging my Venoms into close combat – hell, I need to stay away from close combat with Kabalite Warriors as much as possible! I keep giving Sybarites agonisers, but that really should be a last-resort thing. At 4 points, the weapon is hardly breaking my bank, after all! I was really pleased that my Haemonculus managed to get off Crucible of Malediction on both the Weirdboyz, killing one and reducing another to 1 wound, so that was a lot of fun. Unfortunately, to do so meant putting him across the board from the Wracks, so they couldn’t benefit from his buff. Wracks in general were quite poor this game, I feel – particularly as I made the decision to charge a Killa Can with one unit, meaning all of their weapons would only hit on 6s!